Are you just a small town girl… livin’ in a lonely world? The music is already calling you back. What strikes you more—the iconic power ballad? The fantastic techno? The hyper fashion? The war of the decades is on and the ‘80s intend to take home the trophy once and for all. Every decade has a few kickin’ tunes. There’s no argument. But, which had the best cartoons? No contest. Rescue Rangers and DuckTales? Super Mario and that joyous Friday afternoon where we’d see Zelda and Link? Excuuuuuse me, but how can the other decades even compete? 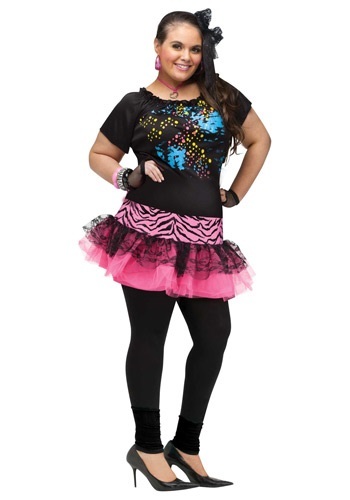 And, now, it is time for you to join in the victory celebration with the ‘80s Pop Party costume. Whether celebrating the end of the world as you know it or wanting to spin round and round, the unique style of this garb will make sure that the lights are on you. The multicolored printed top and zebra stripe skirt give you a color balance unseen in thirty years. Don’t forget your black lace hair scrunchy and matching mesh glovelets, because you are going to own that boulevard!